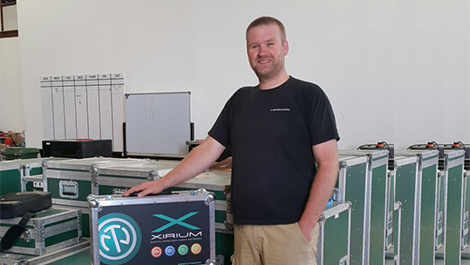 Nicolas Kyvernitis Electronics Enterprises (NMK), distributor of Neutrik in the United Arab Emirates for the live sound market segment, has supplied Delta Sound with Xirium, new technology that transfers audio wirelessly. Xirium is the only device which gives full band width from 20Hz – 20kHz. With two devices only you may set up a wireless audio transmission in a few seconds that fully replaces cables and is more cost effective. “NMK kindly gave us a demo Xirium system to try in December 2013. We used Xirium as an audio backup of the NYE fireworks music, which we transmitted worldwide. One transmiter and one receiver were setup over a distance of 400m, across the crowd and Burj Khalifa lake. Both units worked flawlessly for the whole event,” said Rob Turner, Senior Engineer at Delta Sound. “So many of the venues do not offer a safe route for a cabled solution, Xirium gave us a solution. Making use of the repeater function gave us the ability to get to areas that were out of sight of the transmitter. The best feature of the Xirium unit has to be its ease of use. From getting it out of the case to passing high quality audio in a matter of seconds is always a good thing. We are very satisfied with all the help and support that has been given to us by all of the NMK staff,” he added. Delta Sound is a global audio & communications supplier specialising in sound design, equipment rental, equipment sales and communication systems with operations in the UK, Dubai & Qatar. The company focuses on large scale sporting events, corporate entertainment, live music, product launches and live public events.